The study looked at how flood risk is exacerbating the challenge of finding safe, affordable housing in Houston. Downtown Houston flooded by rain from Hurricane Harvey on Aug. 29, 2017. More than 475,000 people in Harris County currently live in multi-family units that are located in a flood risk area, according to a new report by the Greater Houston Flood Mitigation Consortium. 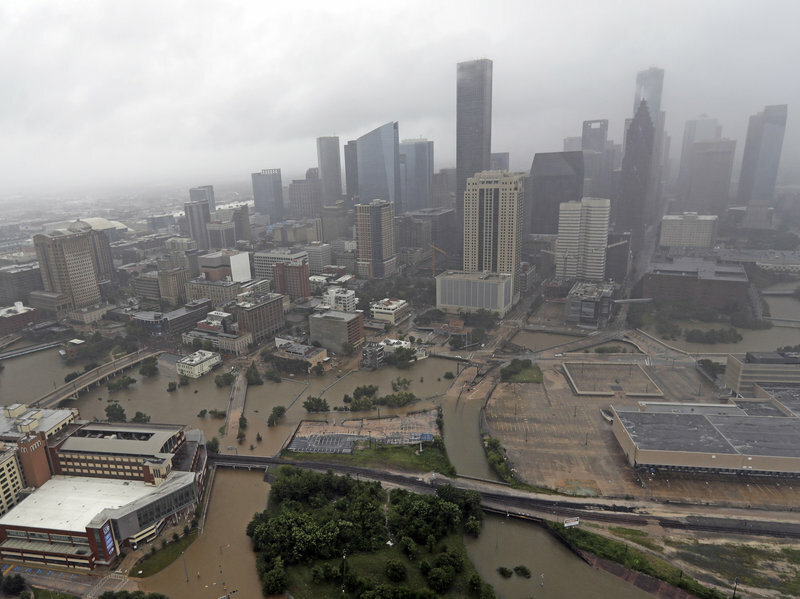 The study looked at how flood risk is exacerbating the challenge of finding safe, affordable housing in Houston, especially in the wake of Hurricane Harvey, which damaged thousands of units across the county. According to the report, 165,793 units – 26 percent of all multi-family units – are located within a floodplain. The researchers said they focused on renter households, in part because they represent a significant chunk of the population. Currently, 45 percent of households in Harris County are renters. That number is even higher in the City of Houston, with 57 percent of households renting. “Many of those renters are from very low and extremely low income households, and that supply is not keeping up with the demand and so it’s creating a very big challenge, which is amplified by the flood risk,” said Kyle Shelton, one of the report’s co-authors and the director of strategic partnerships at Rice’s Kinder Institute for Urban Research. The report found that half of the renting households in Harris County spend more than 30 percent of their incomes on housing. The researchers also looked at four neighborhoods in greater depth: Greenspoint, Gulfton, Northshore and Westwood/Alief. Roughly two thirds of all renter households in those four areas made less than $35,000 a year. Greenspoint was one of the areas hardest hit by Harvey, with over 3,000 units impacted. It’s also one of the areas with the biggest gap between median hourly wage and the wage needed to afford fair market rent, according to the study. “Even if you’re on the second floor in a flooded apartment, you’ve lost your car, potentially access to work and a number of other things” said Rogers. The report found a growing gap between the supply and demand of affordable housing in Harris County. “Based on historic and projected demolition and construction, the Harris County region is falling behind on protecting and constructing new affordable housing, squeezing the most vulnerable families even before another disaster hits,” reads the report. For example, each year the county loses an average of 1,850 multi-family units due to demolition. On top of that, between 1990 and 2017, the average number of new units being built each year (6,112) lagged the average number of new renting households (7,946). To tackle this widening gap, the report proposes a three-pronged approach: preserving existing affordable housing, building new affordable units, and protecting vulnerable families from flood risk. A full copy of the report can be viewed, here.